No, it's not a new reality show; it's the second in the group refashioning projects organized by the great crew of the men's shirt refashion swap from early this summer. Miranda of One Little Minute got a bunch of us together and matched us up randomly to remake men's shirts into creative projects for one another. It was so much fun and everyone had such creative ideas, so this time she up'ed the ante... we refashioned PANTS this time! So, this week I'm sharing with you the pants that I refashioned for Liz, my "customer." Next week, I'll show you how I wear the pants that Miranda, my seamstress, made for me! So my challenge was, take a pair of pants (not jeans, pants) and refashion them into something cute my partner would want to wear! Liz wears brights and skinny jeans so well, I leaned that direction from the start. I had a few ideas for pants refashioning, although nothing too ground-breaking, but I wanted them to be fun and versatile for early fall--and hopefully work with Liz's bright and cheery style! I wanted to do colored pants, sooo much fun, but my Goodwills didn't produce the perfect subject and I went a bunch of times! Oh, well. Since I wasn't stuck on any of my design ideas (center front ankle slit? Stencil? Colorblock somewhere? ), it was more open. 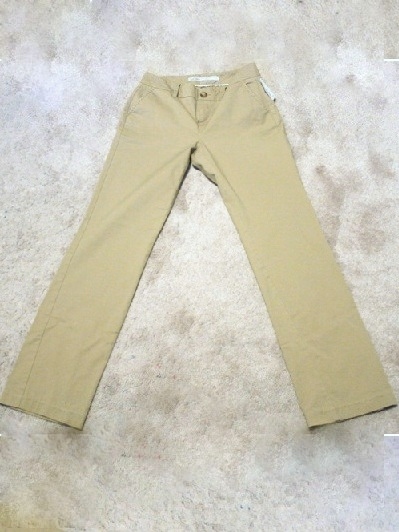 So I found these Old Navy khakis at Goodwill--they looked like they hadn't been worn much, newer style, lightweight cotton stretch, and I figured, good blank canvas! Before: Booooring. Kind of flared but not really, more just sort of shapeless from the thigh down, I bet. After: Skinny fit, colorblock hem!! It may not look like a huge change, but I'm sure they'll feel like a whole new pair of pants. I took them in all over to fit Liz, and to have that straight/skinny fit through the legs and ankles. Then to show off the edge, I pressed and turned and pressed under 1/2" on the red, and folded it to just 1/8" or so beyond the joining seam. Then I stitched in the ditch and had a visible hem band, basically. I kept saying "cuff" in my head--colorblock cuff, but really it's not a cuff since it doesn't fold back on itself. I could have done a cuff, I guess... but I like that these are smoother--makes it more of an actual colorblock, less of just a contrast cuff. So, it's a colorblock hem, I guess. Suzannah I can totally see Liz rocking these, I think this is awesome. It's amazing what fit and a pop of color can do! Those remind me of some I just saw this morning at JCrew. I love them. great! I would like to know how to do that.. I love these! Simple and classy with a cute pop. As usual, I want a pair now, too! Oh this is super cute! Out of every tutorial and garment you have made, this is my favorite! Those are ridiculous cute. I love that pop of color. I wonder if it wouldn't be possible to make an exchangeable cuff so someone could easily switch out colors to go with what they are wearing. I love the pop of color on the bottom! So cute! I love it! I wish my sewing machine was up and running so I could do something similar-you are a huge inspiration! I love how this turned out! Color block pants are awesome! I love these! They're so simple and cute! These are SO cute! I hate how I always flash back to private school when I am wearing khakis, but not in these!! So true, I have that problem with light-colored pants but I guess this would be a good change! They turned out so great! I love the colored cuff! in case you haven't seen yet- you were featured on craftgossip.com. the cuff is great. such an easy but stunning change that I've never seen before. So - the side seam. I've run into this too when making skinnies. Is there any avoiding that side seam wrapping around? (I think I know the answer - and that is, well, yes, Georgia, there is, if you want to calculate just the right amount to take in EACH side seam...and if you want to re-French seam the outside leg - is that right?). I guess I'll just have to accept it, move on, and OWN those new skinnies!